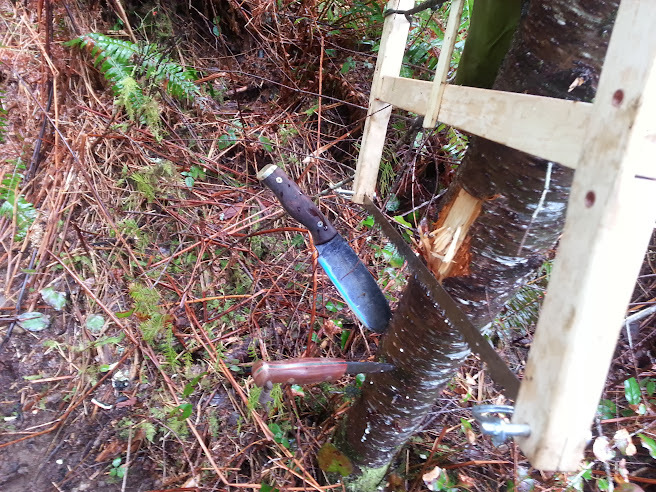 A while ago I was asked about the use of saws while bushcrafting. I carry a very nice buck saw that I picked up from a vendor at BushcraftUSA.com. You can see it here. Many times, however, carrying the extra weight of a complete buck or bow saw is not a viable option. Instead you can carry the blade or cutting portion of the saw and make your own frame for it. 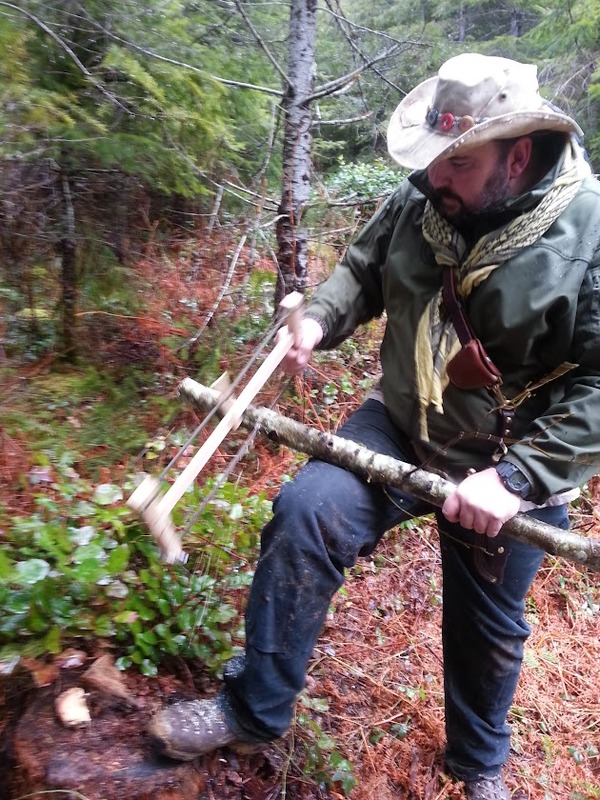 Here are a couple examples of how to build your own bow saw and buck saw while out in the bush. The first real “secret” to building field bow saws is making sure that you get some wood that either already has the natural bend to the shape or to get some nice, green wood that will bend without breaking. Either way you need something that can take the bow shape but is strong enough to not bend too much while under use. As you can see from the picture, it is preferable to make some notches in the ends of the wood to allow your saw blade to remain stationary while under load. The easiest way is to use your saw blade to make some slits and then use your knife to remove the chips. In the case of the saw I have pictured below, I was able to just slide the rings over the branch and rest them into the notches. I like using snare wire to keep things in place, so that is why you see the wire around the ends of the saw blade. This isn’t necessary, but it is more standard practice for me than anything else. In this instance, I took a dead branch that was still just green enough to bend and not break. The saw blade is one of those “survival” saws that come in a kit. 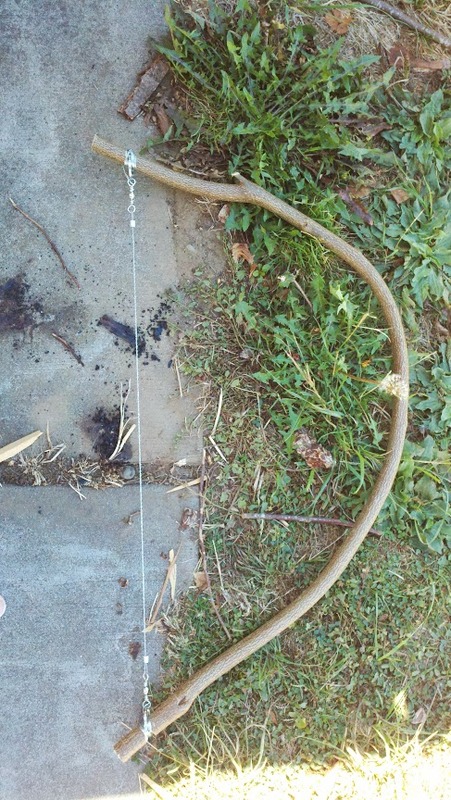 Although using it is kind of slow compared to other saws and methods, it definitely works. When making a buck saw, the hardest part is getting the middle branch to stay put under stress. If you don’t notch or drill your holes correctly, that middle brace will squirt off to the side and collapse the whole saw in upon itself. The best way to keep that from happening that i have found is to ensure you drill holes and use some sort of a pin. What I did on the saw below was a little different. I cut the notches for the cross brace and carved in some pins to insert into the holes I carved into the upright braces. This gave me both a solid up and down stability and a twisting stability from the pins. I have also seen holes drilled and dowels carved. This also works, but I was using a large knife and didn’t have a decent carving knife or a drill to use. To tighten up the whole saw frame you can just use some 550 cord or such and wind it up with a stick like you see below. It works quite well and when the cordage stretches you can take up a few more turns on the cord to tighten things right back up. The easiest part is the slit for the saw blade. As you can also see, I again used snare wire to keep the blade on. This is just something that I do and have found works quite well. 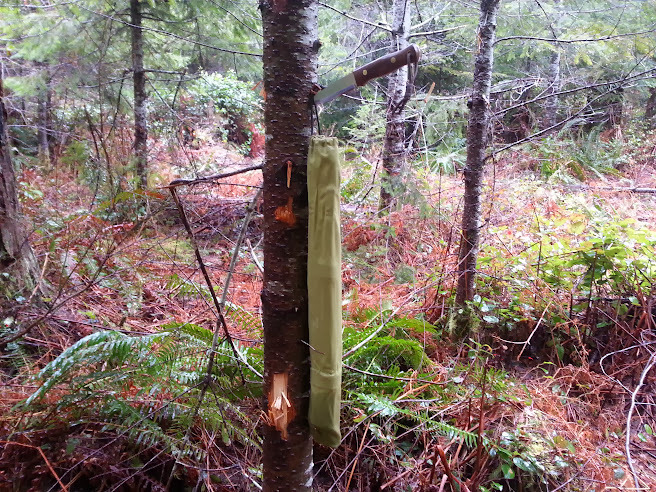 Since I have rolls of snare wire and carry a roll to the field with me in my survival kit, many field projects find themselves completed with the aid of snare wire. 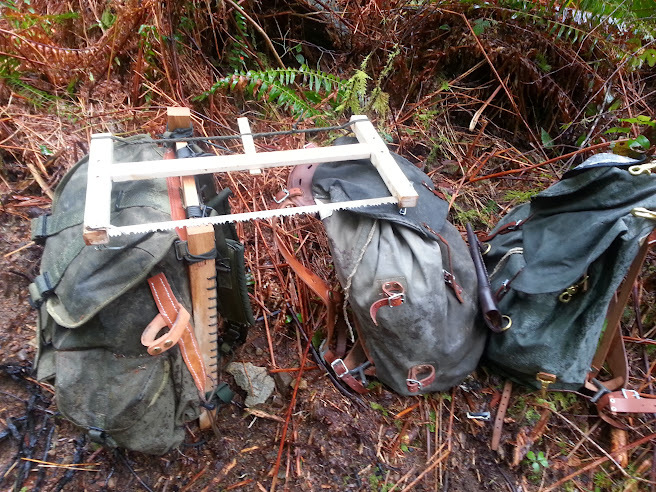 Next time you are in the field and want to so some fire preparation do yourself a favor and make a saw frame. With some practice and testing you can come up with a great design that works well for your needs. In case you were wanting a step by step build of the buck saw, I have embedded a video th assist you. Again, it is quite easy and works very well. 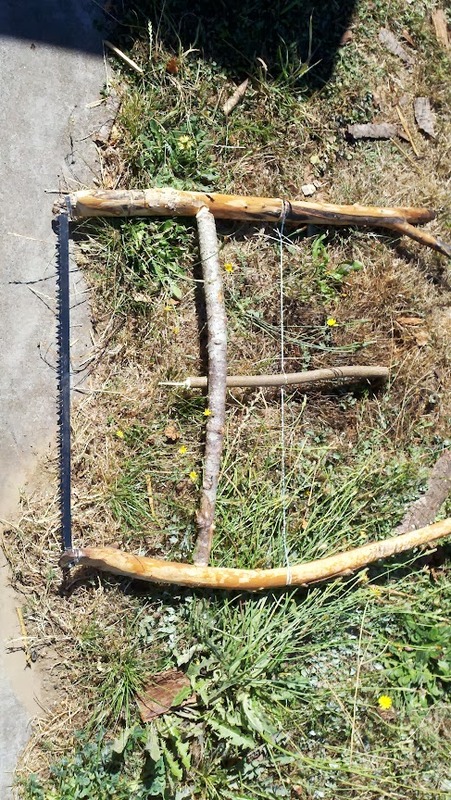 This entry was posted in Camp Techniques and tagged bow saw, bowsaw, buck saw, bucksaw, building a saw frame on December 26, 2014 by Woodsbum. Finally got a chance to get out and do a good review of BigDaddyHoss’s saw he is making. Since it was my birthday, I took the day off and drug the family out to the woods to play around. Of course it was quite squishy, so most of the pictures have a side order of mud and slime. I also messed up and forgot to turn off my GPS so my battery died about the time my son got the fire started. That means that you guys miss out on the fire, bacon/pepperoni sandwiches and Bailey’s with coffee…. Sorry…..
Well, I must say that the way that this saw is packaged makes it VERY easy to transport. I drilled a couple holes in the bottom of my pack frame to tie it. All the parts fold down and slide right into a very convenient cover. It literally is small enough that you could put it into a quiver or the straps on an M39 pack if wanted. Packed size of the saw. Great packaging. Saw assembled. M39 and French rucksack for comparisons. The design has slots for the cross piece. This has always been what has “gotten” me in the past. Most saws don’t fit snug enough to keep the blade relatively tight and protected from my bear paws. 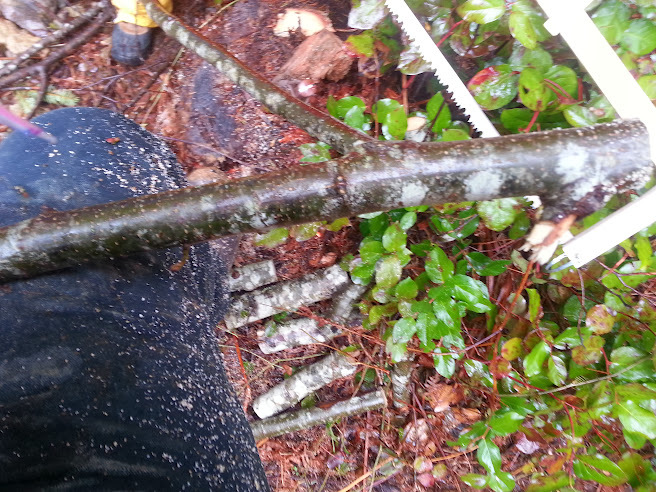 This is why I have tended to use some sort of wire or chainsaw type bladed design. If you look at the way that this one is built, the inserts/slots keep the blade from being able to collapse. Now other saws use this design, but BigDaddyHoss did a really good job of fitting everything tightly enough to withstand my abuse. I really love the way he did this. It has saved the blade from being destroyed already. Now here is one problem I have run into. It is with the pins and cold weather. In the cold and wet, the pins are difficult to get into place during assembly. I do like how there are metal pin holes, lanyard holes, or whatever you want to call them. Without these, assembly would be even more difficult in the wet and cold. It might just be one of my many issues with things, but it has caused me some curse words at times. Once it is assembled, I do sing its praises however. The tight fit is what makes it take the abuse I put out. As you can see from the pictures, it is pretty dirty and stained already. The blade is tightened through the use of paracord that comes with the saw. There are a couple of notches for the cord to fit in and I was actually very skeptical as to whether it would stay in place. So far I have yet to make it slide or slip even slightly. This has been used in the rain, snow, sleet, and even for a short period of dry weather. If you look closely you can see this thing just eating the wood. Seeing as how I never really use saws, but am more into axes and knives it takes a lot for a saw to impress me. I cut enough wood for afternoon in about half to a third of the time it normally takes me with an axe. Me using the saw. Check out the dust flying from my cut. My main problems with saws have been my inability to really get it to stay together during use. I tend to bend bow saws and get annoyed with little hand saws. I have even tried making several buck saws like this, but have had always bent or broken the saw blade in no time. Now I understand that it all comes down to my crappy technique and vicious nature in which I try to use my tools. Bad Wayne… I get it. What impressed me is that this was the 5th or 6th time that I have used this saw and it has yet to break or even bend the blade. You guys can’t even comprehend how impressive this is to be able to withstand the hell I dish out. You can see the wood chunks and saw dust at my feet. This was only a couple minutes of work… As in maybe five minutes with me directing my son on making a pot hook while I sawed. You can see all the dust and what I cut in just a couple minutes. Here is a good picture of it covered in mud and dirt along with an MP Direwolf and AS Mountaineer. 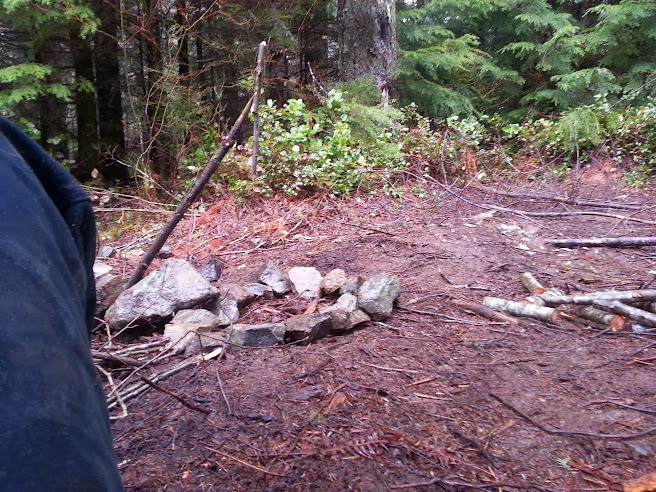 Well, here is the fire pit we put up and a small corner of the wood pile I made. The wife and son had taken off to find some good kindling. So I assumed “the position” to wait. 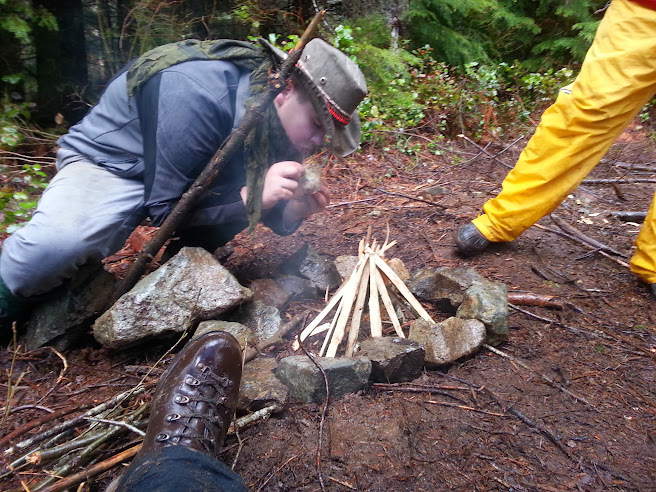 Here is the son building our fire. I took his firesteel away and made him use flint and steel. The kid is blowing a piece of charcloth into flame with jute twine. 1) Small and easy to carry. The design regarding takedown and storage is impeccable. 2) Setting this up with cold fingers can be a little trying, but it is really a tight fit. The way it was designed, the blade (no matter how hard I seem to try during use) resists bending and breaking. 3) It is tough. I already dropped it off a bridge (long story – remember cold and snow?) and it didn’t even scar it up. 4) I love the Bahco blade. It cuts through wood like it was nothing. My wife was out there using it today as well. No problems and she loves it as well. 5) The craftsmanship is awesome and it really is sweet looking. 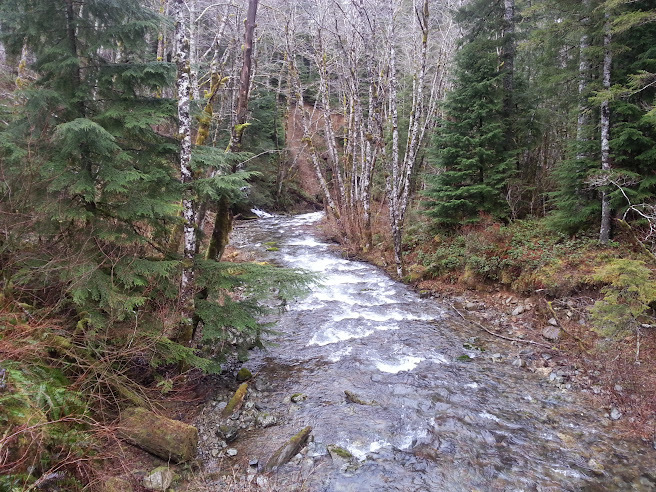 To end it out, here is a good picture of the creek next to where we were playing around. 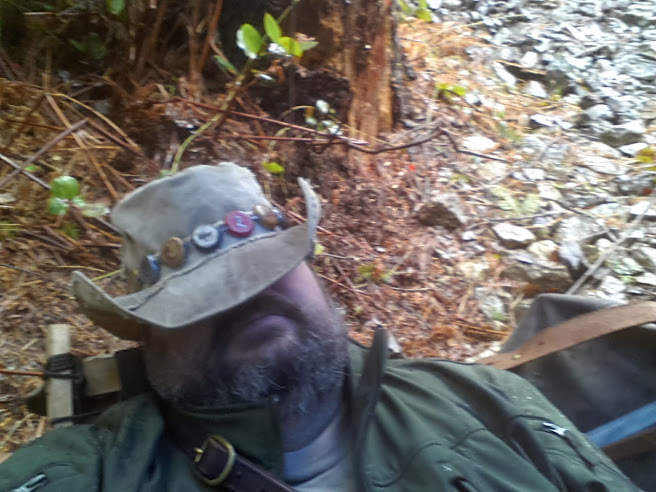 This entry was posted in Edged Tools and tagged bahco, bucksaw, bushcraft saw, custom saw, folding saw, pack saw, woodscraft on February 25, 2014 by Woodsbum.